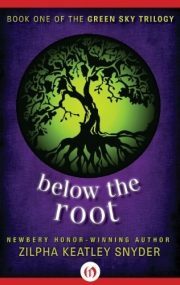 Zilpha Keatley Snyder’s 1975 novel Below the Root is the first volume in her Green Sky Trilogy; the subsequent volumes were 1976’s And All Between and 1977’s Until the Celebration. Not only is this the first Snyder I have knowingly read … until this review was commissioned, I had never heard of this prolific Newbery winner. It just goes to show there is always more to learn. All hail the Chosen One! Or at least a Chosen one; young Raamo D’ok’s psychic abilities earn him a position as a trainee Ol-Zhaan, the ruling class who govern the world of Green Sky. Even before his training begins, selection brings with it status and respect, a development that baffles Raamo. He has as yet done nothing to earn respect. It is not the only false note in Raamo’s world.